The extensive application of portable energy storage units fostered by technological innovation has determined a rapid increase in the volume of batteries annually placed on the market. Around 211,000 tons of portable batteries were placed on the market in the EEA area, plus Switzerland, in 2013. This trend and the short lifetime of batteries have imposed the disposal of a progressively increasing flux of end-of-life batteries. In this framework, central issue is represented by the development of processes allowing for the recovery of material from end-of-life batteries. This strategy can reduce the environmental impact of the battery production cycle by preventing the dispersion of the battery hazardous elements (heavy metals) into the environment and, at the same time, providing an alternative material source to the battery manufacture chain. In accordance with EU Directive 2006/66/EC, which currently regulate the disposal and recycle of batteries, 65%, 75% and 50% (by weight) recycling efficiencies must be achieved by processing of lead, nickel-cadmium and other batteries, respectively. Around 70% of portable batteries placed on the EU market are non-rechargeable (primary). In this market segment, primary lithium batteries exhibit characteristics that impose significant recycling difficulties. These are mainly determined by the presence of metallic lithium (non-oxidized metal form Li(0)) which can, when warm, react exothermically with oxygen, nitrogen and water and must therefore be appropriately handled and/or deactivated prior recycling to remove the risk of flames and/or explosions. 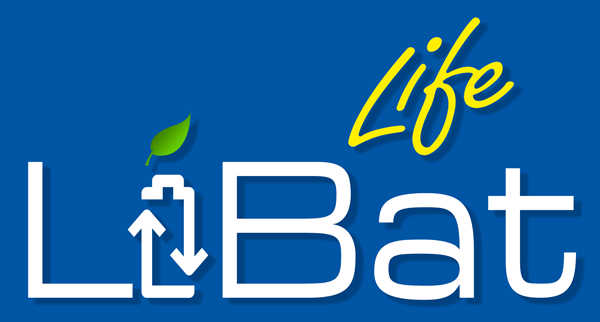 LIBAT project is aimed at the demonstration of an innovative process for the recycling of primary Li batteries (Li(0)/MnO2 batteries). The proposed process integrates mechanical pre-treatment with a hydrometallurgical treatment route to recover plastics, ferrous and non-ferrous metals. In agreement with the EU Directive 2006/66/EC, a material recycling efficiency greater 50% is targeted. Compared to alternative recycling technologies, the proposed process allows separately recovering lithium and manganese products. The process will be demonstrated by the construction and operation of pilot plant with processing capacity of 50 kg of batteries per day. This preparatory activity is aimed at requesting the authorization needed to construct and operate the prototype implementing the proposed recycling process at the SEVAL industrial site. The activity includes the collection of all technical documents necessary for authorization granting (process description, identification of equipment, mass and energy balances, waste composition). This action regards the design and construction of the prototype plant for the recycle of primary lithium batteries (Mn-Li(0) type). Plant design and construction of both the mechanical and hydrometallurgical section are performed to ensure a processing capacity of 50 kg/day and a material recovery yield not lower than 60%. This action includes the formulation of a detailed process flowsheet (including mass flow rate and temperature of any stream), design of equipment, tendering and offer selection, plant construction and commissioning. Activities to be performed in action B2 are aimed at demonstrating the operation of the plant where the process for the recovery of the target components will occur. This will entail verifying the fulfilment of performance requirements fixed in action B1. Operation of the mechanical section will allow fractionating processed batteries into the following main streams: ferrous metals (iron, copper), nonferrous metals (Al), non-metals (plastics, paper) and electrodic powder. The latter powder will be collected and stored and finally fed to the upstream hydrometallurgical section to recover Mn and Li. production of 1000 Kg of electrodic powder, 1000 Kg of iron, 50 Kg of nonferrous metals, and 250 Kg of nonmetals. This action will be aimed at demonstrating the operation of the plant hydrometallurgical section, where the process to recover Mn and Li from the electrodic powder derived in action B2, will occur. This section will be operated to minimize the volume of wastewaters generated per batch. During this phase, operating parameters of any unit will be optimized and possible deviations between plant performance and previously derived lab-scale results will be analysed. 1000 Kg of electrodic powder will be processed to produce about 200 Kg of Li2CO3 and 500 Kg of Mn(OH)2. Data derived by demonstration activities performed in actions B2 and B3 will be exploited to assess the economic feasibility of the proposed process. The analysis will be performed for the constructed prototype plant and will be successively extended to cover larger process scales. Main objective of the action will be identifying the possible applications of the recovered products and evaluating the incomes that can be derived from the sale of recovered products. A quotation will be asked for ferrous and nonferrous metals recovered by mechanical treatment. Attention will be devoted to analysing the re-use of the products recovered from electrodic powder (Mn(OH)2, Li2CO3) in the manufacture of batteries. The economic feasibility analysis will entail quantifying the costs associated to plant construction, reactant and energy consumption, waste disposal. The analysis will be assessed by comparing computed costs with the incomes resulting from the sale of recovered fractions and the fee due for the treatment of batteries. Process simulation will be implemented to obtain the economic figures of the different process options and evaluate profitability as process scale varies. A study of the transferability of the proposed technology in two different EU countries will be performed. This action will include activities aimed at monitoring the plant design and construction and the performance of constructed plant and of derived products. The following activities will be implemented: verifying that deliverables have been effectively completed in accordance with the scheduled program, monitoring the status of preparation of offers requested to candidate suppliers (tendering phase) and the status of manufacturing of required equipment requested to selected suppliers, monitoring the evolution of the construction phase and monitoring the evolution of plant commissioning. The activity foresees the monitoring and evaluating of the performance of the prototype constructed in action B1. The environmental (LCA analysis) and the socio-economic impact of the project will be also evaluated. This action will include activities aimed at communicating project results to the identified target groups across EU and establishing a network for the dissemination and effective exploitation of project results. Through different means as social media, press release, newsletter, leaflets distributed in conference and exhibition, the project development and results will be declared. The research activity will lead to publications in scientific journal. Furthermore, an Open day at the demonstration site will be organized in the frame of the Final project conference. This action will include the following dissemination activities: creation and management of a project website available in both Italian and English, which is periodically update with the main project achievements, news and events, including public deliverables; the application of a project information board reporting a compact description of the project objectives at the entrances of the partner’s offices; the elaboration and diffusion of a Layman’s report which will contain a description of the project objectives, achievements, main technical results and conclusions. This activity foreseen the establishing of a network with other EU projects for the dissemination and effective exploitation of project results. This action will be aimed to the implementation of project management ensuring high quality of project implementation, results and dissemination. Project management will include General Project Management and the internal administration of any project partner. Furthermore, the activity foresees the management of monitoring indicators, an external audit of expenditures, an after-LIFE plan, the preparation of certification and implementation policies and the application of green procurement principles.